In the build up to the invasion of Iraq, on the back of outrageous lies about weapons of mass destruction, we were promised shock and awe, to be followed by the liberation of a people. In the end, we got the London bombings, Wootton Bassett and the proliferation of jingoist militarism, and, above all else, the unimaginable numbers of Iraqi dead, wounded and displaced. 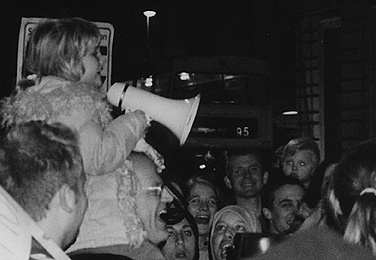 On the day that Iraq was invaded – Thursday, 20th March, 2003 – together with thousands of others, we walked out of our workplaces in protest and took to the streets of our city. For a very brief moment we felt the certainty of our collective convictions, permitting us to step outside ourselves, discard our ordinary lives, and turn the world upside down. We marched to lose the feeling of powerlessness and out of a conviction that the only course of action left was dissent. As the obfuscation from the corporate media is perpetuated in what laughably passes for analysis in their ‘ten years on’ retrospectives, we thought it timely to reprint a short text of ours from that time. How could we not be suddenly compelled to take to the streets, possessed by the spontaneity of the imagination’s most vital weapons, to gather with strangers against an outrage amongst many outrages, against the intermingling of blood and oil, against the murderers who would wear our faces? How could we not become intoxicated by the forests of banners gathering in the twilight hour, the cherubim with megaphones, the noise, marionettes, humour, elation; blocking the crossroads of a life that many would prefer to go blindly on as if nothing had happened? How could we not become addicted to dream’s certainty over the habitual apathy of spectating? How could we not become part of a dream into which we were drawn from moral necessity, to leave our computer screens or let our pencils drop to the ground, wander freely from our open prisons, and walk out into the middle of the road, facing the oncoming traffic and lines of police horses, to partake in the imagination’s palpable insurgency? How could we not participate in the making of a sudden breach, until all at once the everyday flowered with innumerable incidents, chance encounters multiplying like snowflakes until everything looked new, marvellous, filled with wonder? In an upsurge of dream, mundane life became transformed, momentarily revealing an experience of what can be, enabling us to understand social space poetically and politically. How could we not turn into pallbearers on a last slow march around a familiar and well-worn path, witnesses to that moment at the very end when everything became quiet, no voices raised in protest, but only an outrage of silence? A moment when we remembered that it is still possible to make the world other than it is. How could such a dream not remind you that the future can be made in dreams and that the present so often confirms past dishonesties? There is no price to be paid for this dream. The world has already seen too many crusades.